Sometimes the hardest part is deciding on a customization, so I thought I would give you a few ideas to spark your creativity! -Family: Names of family members in the center with last name on the bottom along with the year. -Coordinates of a Special Location: could be perfect for a new home, the place someone got engaged, the location of their wedding, the university they graduated from, a place where they accomplished something huge. The possibilities are endless and coordinates are always a good idea! 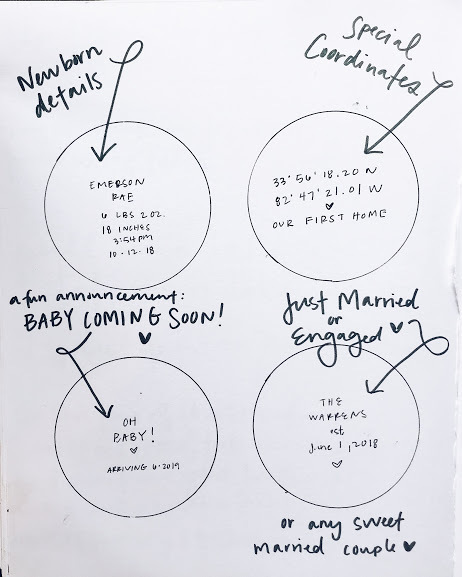 -Baby Coming Soon Announcement: (again, baby fever, sorry!) I just think this would be the sweetest way to surprise friends and family about a baby! I’m picturing all the family gathered around the tree opening presents and someone opens this present to reveal the newest member of the family coming soon! -Just Married/ Engaged/ Long time Hubby Wife: A way to celebrate new beginnings and long lasting love stories. Below you can find a couple of stamped out ideas, plus a couple of rough sketches! I hope they inspire you! Click here to shop ornaments!